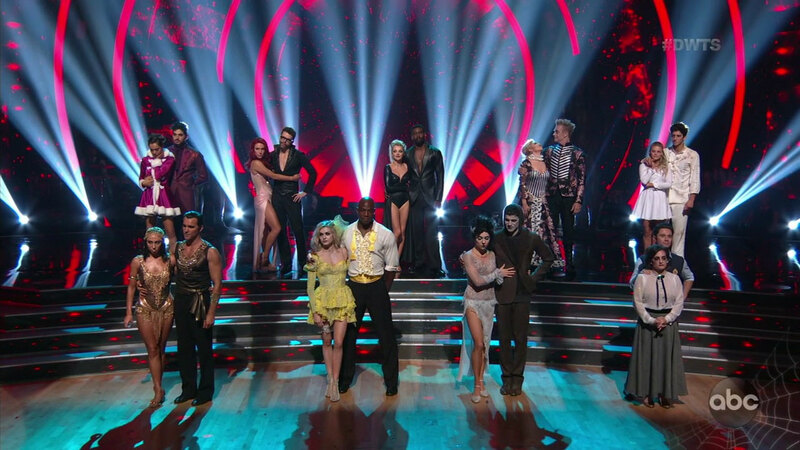 LOS ANGELES -- "Halloween Night" on"Dancing with the Stars" saw the pro dancers pull out their bags of choreography tricks and left dance fans with a great big treat. The show started with everyone joining together for a giant Halloween-themed number from choreographer Mandy Moore. It kicked things into high gear from that moment on. Well he did get his start on a Disney Channel series called "Zombies," so Milo felt right at home with this fright-filled week. He let us know he loves to be scared and when it comes to Halloween, the creepier the better! The dance style is Contemporary and Witney Carson got as creative as ever with this routine. Head judge Len Goodman admitted he's not usually a fan of the Contemporary dances, but this one won him over and he called the routine spellbinding. Bruno Tonioli agreed that it was insanely good, and complimented Milo on his acting skills. Carrie Ann Inaba thought it was a mature and nuanced performance, beautifully executed with complete control. A double perfect score night! Cheryl Burke choreographed a fast, fun, character-filled Jive to the Halloween favorite "Dead Man's Party." Juan Pablo loves Halloween and said he's always created his own costumes from scratch, so he collaborates with the DWTS team for this week's Egyptian theme. Carrie Ann called the dance sheer perfection. Bruno said the Jive was spot on, and Len was happy to see the "how" of technique balanced with the "wow" of performance. Evanna didn't hide her disappointment at the middle-of-the-pack scores she received last week. She came to the realization that, so far, she's been trying to please everyone else in the ballroom (the judges, her partner Keo, the fans) and not herself. With Evanna in the driver's seat, everything changed. She didn't hold back and loved being able to show another side to her personality. The judges liked what they saw, with Carrie Ann telling Evanna she was fierce and that she could tell she worked hard, stepped up to the plate and nailed it. When these two have a camera around, producers don't want to know about their dance rehearsals - it's always the question, are they a couple? Sure, we can see they like each other but do they LIKE each other? A lot of shy giggling went on and we learn Alexis has feelings for Alan Bersten and it's a connection she never saw coming. He doesn't make such a strong admission, but does say you can't fake chemistry. They bring it all to the ballroom for a sweet Jazz routine. The triple 9s from the judges showed the trio behind the desk all have a little crush on this couple. The football star is a little worried about all the hip action he's going to need to do to pull off a proper Salsa: he calls them his "zombie hips." Lindsay Arnold worked and worked with the NFL great to get things moving. And boy does he! Len thought this was DeMarcus's breakthrough night. Both Len and Bruno praised DeMarcus for keeping up with the pro dancers in the routine and said he looked like part of the troupe. Jenna Johnson wanted to choreograph a Frankenstein themed Argentine Tango for Joe. But one thing he hasn't really caught on with this season is the "getting in a character" part of dancing. So Jenna and her fiancé Val Chmerkovskiy joined Joe and his fiancée Kendall at L.A.'s very scary "Haunted Hayride." There were creatures and ghouls and things that go bump in the night at every turn on this dark and creepy ride. But Joe said it did help him understand what it means to commit to a character. Joe and Jenna got their highest score yet, with Carrie Ann praising his presence, Bruno talked about his timing, and Len said it was their best dance yet. Bobby's schedule outside of the rehearsal hall was nuts this week. He gave us his day in a nutshell, starting with the 1 a.m. alarm clock buzzing (so he can do his radio show.) There was a produced montage of his crazy day, with some special effects that enhanced the craziness. All praise to Sharna Burgess for her choreography and teaching skills. The duo's Argentine Tango was their best dance yet. Bruno called the dance intriguing. Len liked the mood and the atmosphere, and Carrie Ann said she was mesmerized by the performance. Pro dancer Emma Slater had an elaborate story for the Paso Doble she choreographed for John. Henry VIII, second wife Anne Boleyn, revenge beheading - it made sense in Emma's mind! John did his best to keep up. All the judge applauded his tenacity and attack, but felt there were too many mistakes in the dance. (Cue crowd booing!) Len said on a Halloween night when they expect things "supernatural," this was neither super, nor natural. The dreaded elimination came at the very end and we saw two couples in jeopardy: Alexis and Alan, and Mary Lou and Sasha. In the end, the former Olympian, Mary Lou, was eliminated.